Obama born in Kenya II? I received an interesting comment from Mr. Lucas D. Smith to my last post where I interviewed Billy Birther, regarding Obama’s possible birth in Kenya. Mr. Smith writes, ” I obtained a certified copy of de facto President Barack Obama’s 1961 Coast Province General Hospital, Mombasa, birth certificate. I obtained the copy, from the hospital itself, on February 19, 2009. Mr. Smith has brought some very interesting evidence to light. However, let me make it clear that I am not advocating that President Obama was born in Kenya—not yet, anyway. I do admit that the case is stonger in light of the fact that Mr. Smith has produced what purports to be a record of President Obama’s birth from Coast Province General Hospital, Mombasa (which is in Kenya), and an interview with Obama’s grandmother, in which she claims to have been present at Obama’s birth—in Kenya. Moreover, Mr. Smith has produced sworn affidavits to back up his evidence. 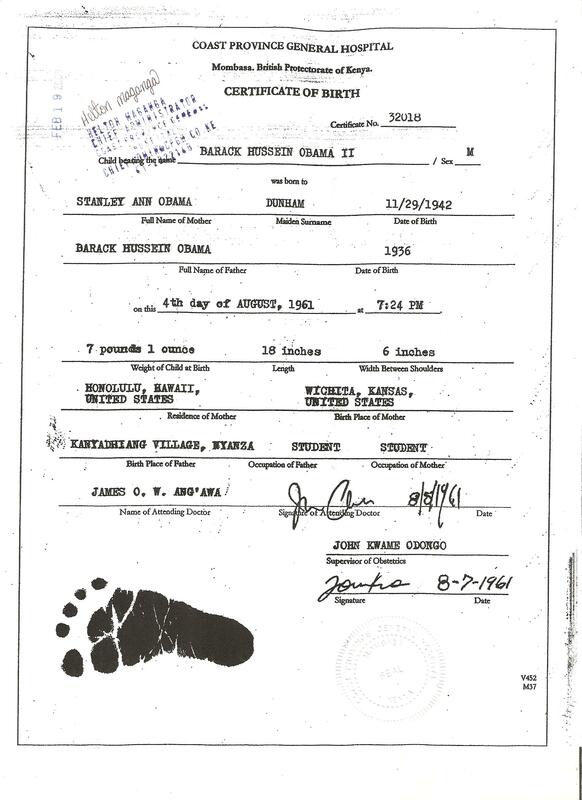 It has always bothered me that neither Obama, nor his supporters, have produced an Hawaiian hospital record of Obama’s birth. In fact, there is a lot about Obama that is hidden from the public—his university transcripts, baptism record, parents’ marriage certificate, their divorce record, his medical records, Obama’s trip to Pakistan with his Occidental College friend, Wahid Hamid—the list is long—extremely long. Why hasn’t Obama been forthcoming with the records of his past? 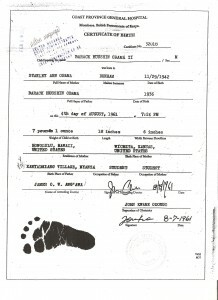 The fact that Obama has chosen to hide his past makes it ever more likely that he was indeed born in Mombasa, Kenya. 5 comments to Obama born in Kenya II? This is interesting, but could not be more false. You left out one fine detail that anyone in the world who has obtained a high school diploma should know: Kenya, along with most countries colonized by the Brit’s, uses the dating format DD/MM/YYYY, yet your ignorant forging has it as MM/DD/YYYY as is the standard in the USA. Stop making a fool of yourself and find something productive to do. Please, Holy Moses! No need to become emotional over the issue. Stop with your unfounded insults, friend, as you are making a fool of yourself. As I showed in my post, I am not advocating any position on the issue, only that it be investigated. 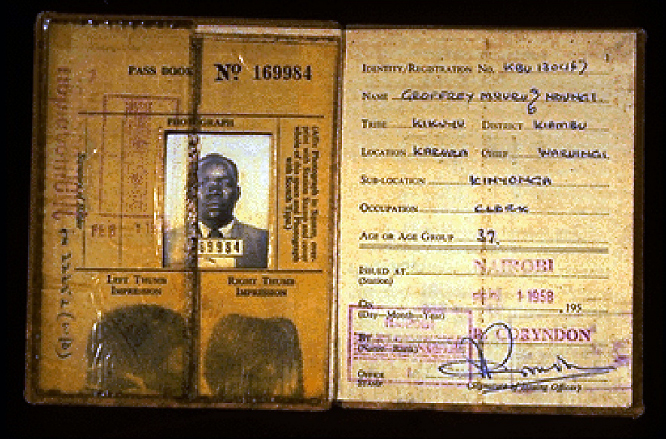 During that period, in Kenya, various date formats were in use. 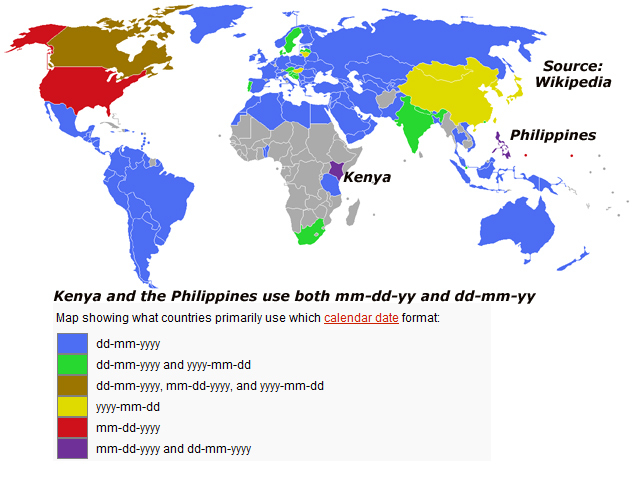 Here is a photo that certainly appears to refute your point regarding Kenyan date formats. That Pass Book has the month written out not, not in numeric form like the Smith birth certificate. If Kenya really used mm/dd/yyyy, it should be easy to find a host of examples like that.